It’s not quite Christmas yet, but I still wanted to go with a holiday-themed color for this week’s Color Friday. Not an overtly theme-y hue, but an unmistakably festive one. So without much deliberation I settled on the elegant shade of Cranberry: rich, distinct, and equal parts edgy and feminine. I think this is a great, warm color for a chilly and celebratory time of year. I happened to come across the above image while doing a little research for Color Friday. It’s from the Houston Museum of Decorative Arts in Chattanooga, Tennessee; a city that is near and dear to my heart because I grew up there between the ages of 2 and 9. Chattanooga is wonderful place, and in my almost-yearly visits since leaving I’ve seen it grow in terms of culture and cool-factor, resulting in a burgeoning arts scene downtown and a unique commercial district featuring everything from organic grocers to an incredible aquarium to numerous swanky clothing boutiques. The museum sits in the Bluff View Arts District, which overlooks a large swath of the city and has one of my most favorite coffee shops in the universe (Rembrandt’s) and a fantastic art gallery, The Hunter Museum of American Art. 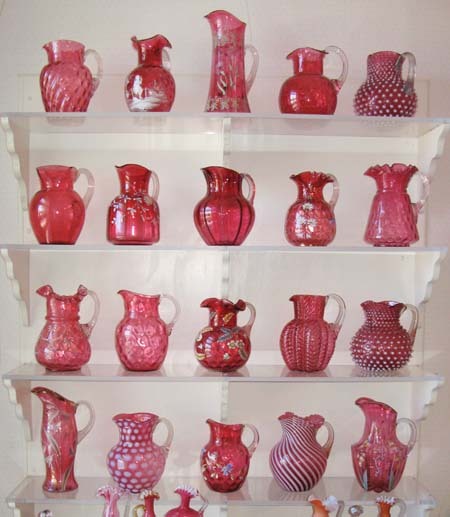 The Houston features pieces that were owned by Anna Houston, a seemingly eccentric Chattanoogan who left her extensive glass collection to be shown to the public; she especially had an affinity for cranberry pieces! I hate to admit that I’ve never been, but now it will be one of the first stops on my tour of the city when I go back. Can you tell how much I love it there? Southern-style Classic architecture meets Gehry-inspired modern architecture. Both wings of the Hunter at night, as photographed by my then-fiance, now-husband. 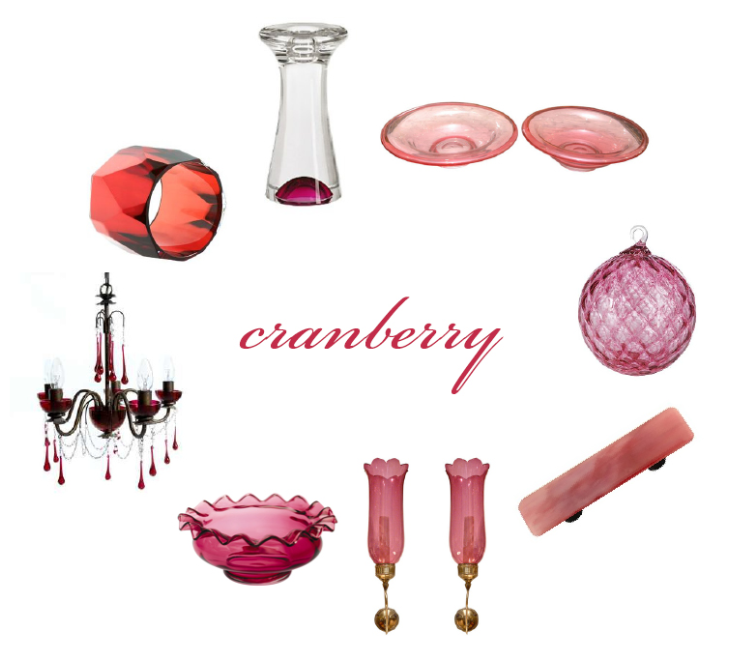 It seems fitting to me that I celebrate the wonderful coincidence of finding such a personal image that is the best representation of my color selection by showing you a collage of cranberry colored glass pieces. I hope you find it interesting, and just a little bit festive!